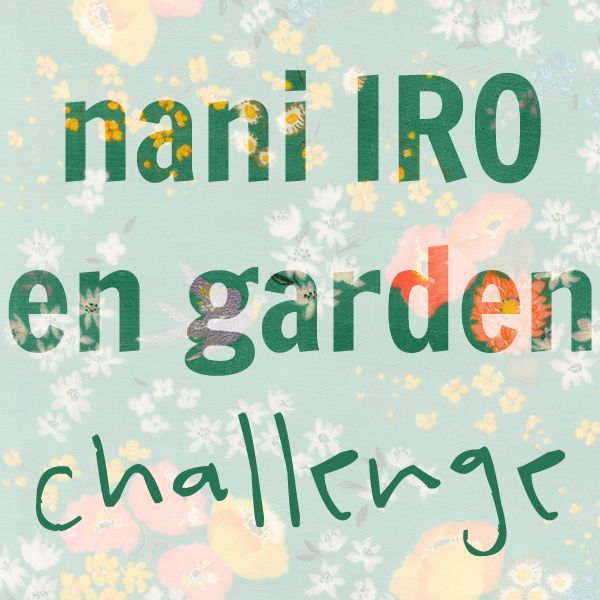 The contest: Rachael sent each of us 1.5 yards of the fabric (Nani Iro- En Garden double gauze– the green is on order but she’s got the pink color way in stock) and we could do whatever we wanted with it. No rules! I just sat and admired the yummy fabric for a week before I cut into it. It really is so exquisite! I took a long while debating on my project. A top or dress were the first things that came to mind but I wanted to do something different for this challenge. So I landed upon shorts. I mean, double gauze shorts, what could be better, right? I didn’t want these to end up looking like pajama shorts though, so I needed a legitimate shorts pattern. 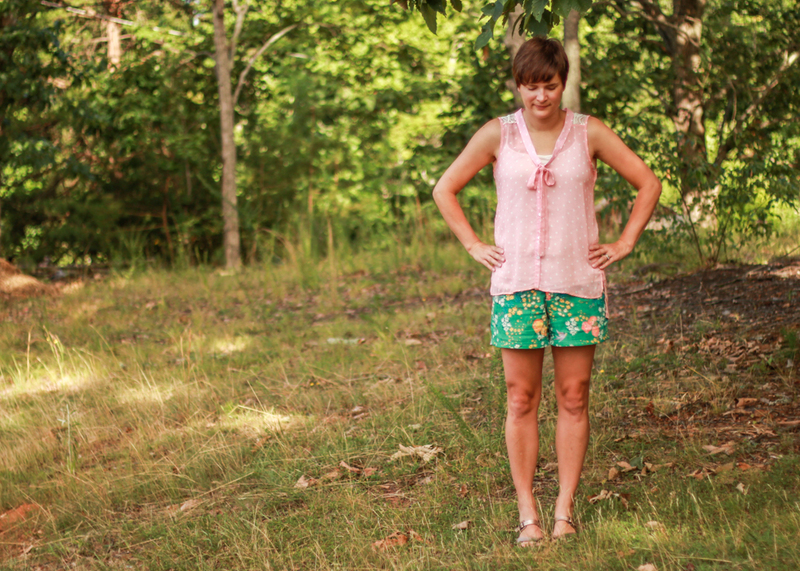 I have made two pairs of Grainline Studio’s Maritime Shorts in the past but neither one has fit quite right. Third time’s the charm though so it just seemed fitting to end up with that pattern. Not to mention I’m a Grainline junkie 🙂 . My last pair were a 6, and while they fit, they cut into my waist too much for comfort. I have a very wide waist compared to the rest of my body so it makes buying pants/shorts difficult unless they have a stretchy waistband. This time I cut out the 8 in the waist and graded it down to a 2 in the legs. I also added 1.5″ to the length as the pattern is just a little short for my comfort level. You will notice that I added a button instead of the hook and loop closure. As much as I dislike buttonholes, I dislike hook closures more, so a buttonhole it was! I used the sew along on Jen’s blog to help me through the zipper fly, but everything else was fairly simple since I’ve made quite a few pairs of shorts (for the boys) recently. The pocket and waistband facings are artisan cotton (in this beautiful purple!- also from Rachael’s shop). Double gauze is kind of delicate, and I thought using the artisan cotton would give the waistband more structure and help it keep its shape. I so wish I had a picture of the inside of the shorts because they are so pretty with all the purple but alas I forgot to take one! I modified the pockets a bit because I thought the shorts needed a more delicate pocket to go with this fabric. I cut off the sides and bottom of the original pattern piece by .5″ and chopped of the top angled portion so it just went straight across. Then I folded the top under twice, top-stitched, and continued with the pocket as normal. I adore these shorts! I wore them all day yesterday and they feel like a dream. The fabric is so soft and comfortable but also breathable for these hot summer days. Just a little note- we realized after taking the pics that there was some dust on the lens creating a weird echo effect on some of the pics and making them look fuzzy. Editing helped some but it’s not perfect. And no time for another shoot before the deadline so here ya go. 🙂 Just keeping it real, folks. Thanks so much to Rachael for sponsoring us in this little contest. It was loads of fun! 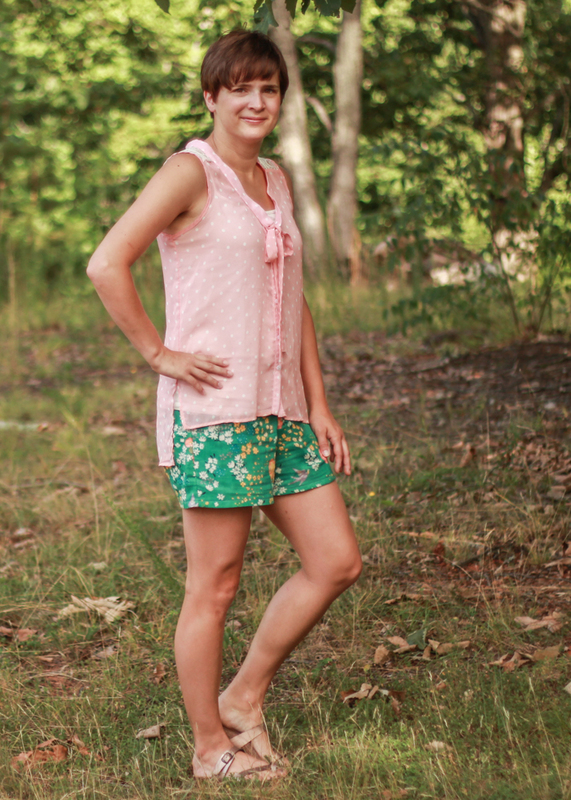 This entry was posted in Selfish Sewing and tagged grainline studios, maritime shorts, nani iro by oliver's fancy. Bookmark the permalink. These are dreamy!! I love that you made shorts. They must be so soft to wear. The fit looks perfect. Oh beyond soft!! Like wearing a cloud. love these shorts!! 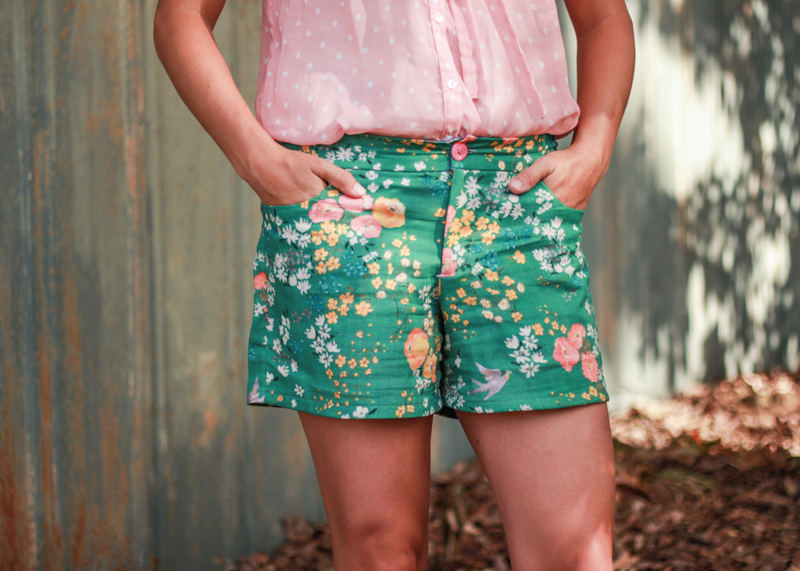 and seriously just before I saw them yesterday I was thinking about how I needed some shorts exactly like these. guess I better get going on that, huh? Brooke! 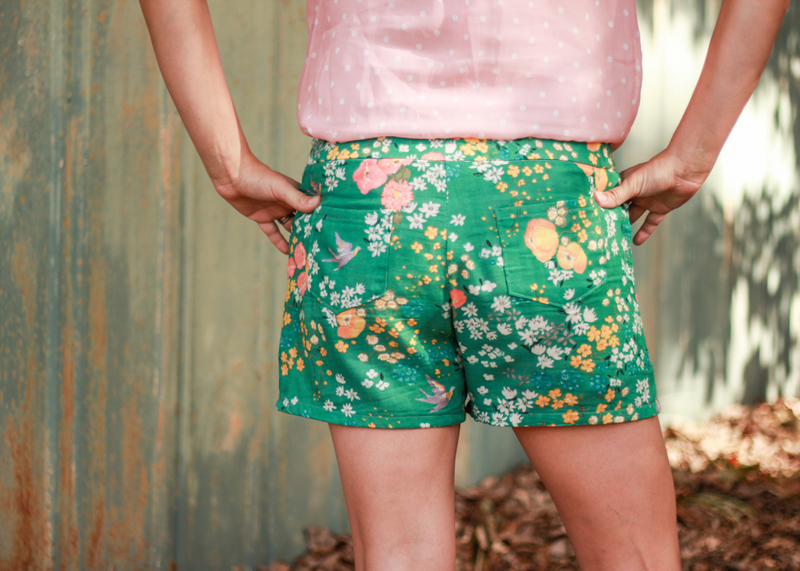 I’m in love with these shorts and you are reminding me that I need to buy this pattern. The shorts look great (and so do your legs 😉) and they do look just perfect for the hot weather. Love, love. You definitely need this pattern. And thank you for the compliments 😉. Very kind. Oh they’re excellent! I had the same fitting issue where the size that fit my waist was too big for my legs and created a sort of skirt effect. Sizing down in the legs is smart! And yeah, I bet these are just a dream to wear. Yeah the skirt effect was what I was trying to get away from. Lol. I really think I might buy this fabric in the other color ways and make all the shorts bc they’re all I want to wear now! These look really great on you! I love how they look with your floaty pink top. I would never have thought to use double gauze for a more structured pattern like this– such a good idea! Thanks. I was actually worried i didn’t have anything to match them and then realized that top matched perfectly. And it’s kinda fun to use such a delicate fabric for this kind of pattern!